The First National Bank’s online experience offers you ways to save, invest, borrow, and insure for the future right from your computer. It allows you to take care of your banking needs from almost anywhere in the world through its web and mobile-accessible services. This guide will take you through the First National Bank’s log in process on the bank’s web and mobile platforms. It will walk you through the information you need to make an informed decision of banking with the First National Bank. Additionally, the guide will help you make the most of the online bank’s services. 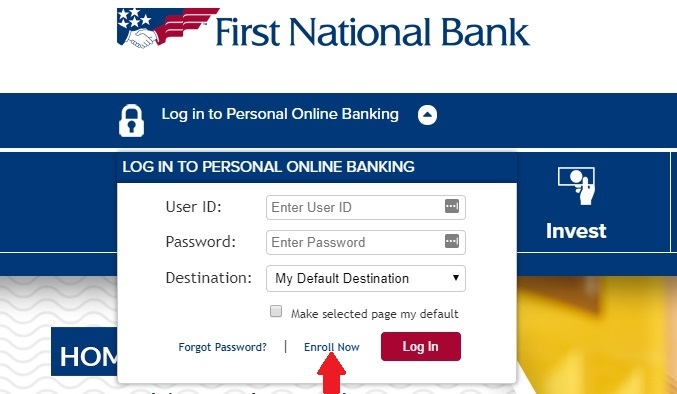 In order to sign in to the First National Bank’s online portal, you need a username, password, and account destination. Open a compatible browser like Google Chrome and head to the bank’s landing page. Click on the drop-down arrow in the top left-hand side of the heading menu bar to log in to Personal Online Banking. There should be three empty fields: User ID, Password, and Destination. Select the checkbox on the drop-down menu to assign the selected Destination field as the default landing page after successfully logging in. Fill in the fields and click on Log In to be directed to your account’s page. There are a few account destinations, including the Overview, Account Summary and Account Activity pages. This destination feature of the log in process directs you to the landing page you are trying to reach. 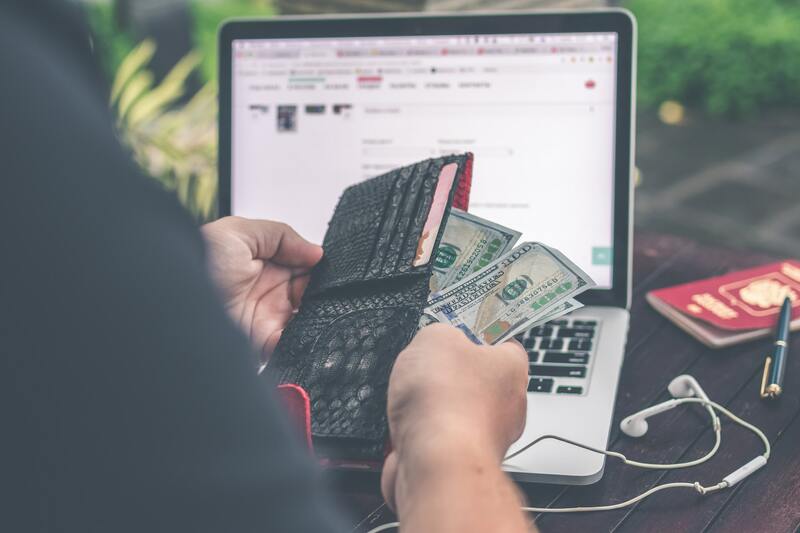 There are also a couple of sections to choose from when it comes to browsing personal banking offers, including checking, savings, and electronic banking. However, there are other banking services aside from personal that are provided through the First National Bank. The two other categories are Business and Electronic Banking. This section offers various checking and savings accounts. Some of these accounts can get rather specific in their function, such as the Lifestyle Checking account that focuses on higher interest rates. The Personal section also has a variety of electronic banking services like Zelle for on-the-go and scheduled digital payments. This section offers a range of products and services from online business banking solutions to treasury management. The log in instructions for this section are the same as those that apply to the Personal section. This section is aimed at offering accounts that conduct routine banking transactions across a variety of payment mediums, including debit cards. The log in process here is the same as in the rest of the bank’s menu sections – Personal and Business. There are two different First National Bank apps available to start banking through if you have an existing account. Make a selection between the two available mobile apps - the direct version, aimed at personal banking, and the business version, aimed at corporate banking. The process of logging in to the First National Bank through your mobile device is very similar to the bank’s online log in experience. Download the app from Apple’s App Store or a similar provider on a different device. Log In using the same steps as you would use online. Make sure you have your user ID and password. The touch ID feature on select iPhones allows you to log in to your First National Bank account with your fingerprint instead of your password. There is also an about page link to direct you to further instruction guides. On top of the about page, there is a location feature to help you find available First National Bank branches and ATM machines near you. This app provides a way to check on account transactions and balances while on-the-go. It also offers you management services for your debit cards and deposit checks. Additionally, there are money transfer options, including an option to pay your friends directly while on-the-go. A popular feature is the FNB branch finder, which also locates any of the bank’s ATMs nearby. This app is capable of managing your business accounts by offering services such as balance checks, fund transfers, and transaction history. Do not download and use this app unless you have an existing business-related account with the First National Bank online. FNB Business is available to all business banking customers at the First National Bank. While the bank’s mobile app is free, account holders should remember that they are subject to a $10 monthly fee for using the app’s services. 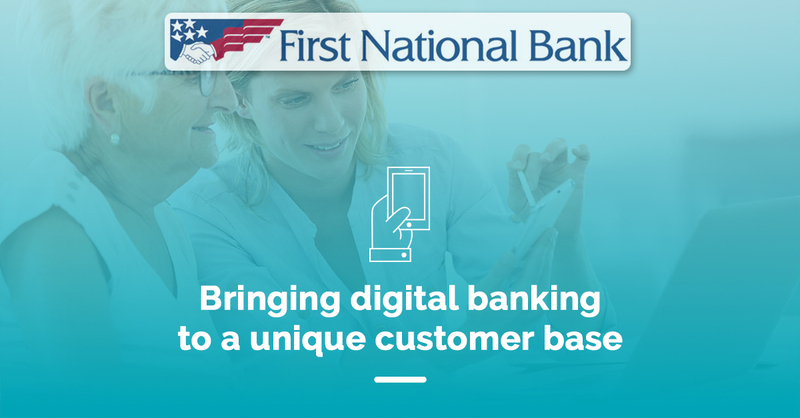 The First National Bank’s online banking experience engages account holders across various platforms, including the bank’s personal banking, business banking, and electronic banking services. There are other sub-services offered through the First National Bank online that are specific and unique to Personal and Business banking operations. There are five convenient options on the menu bar to navigate the bank’s services. These options include banking, borrowing, investing, and insuring services. And along with offering a number of banking tools and solutions through its online portal, the First National Bank also has a range of account types. There are specific accounts in each of its relevant banking sections – Personal, Business, and Electronic Banking. These specific accounts are used for a variety of purposes from health services spending to free flow spending on-the-go. 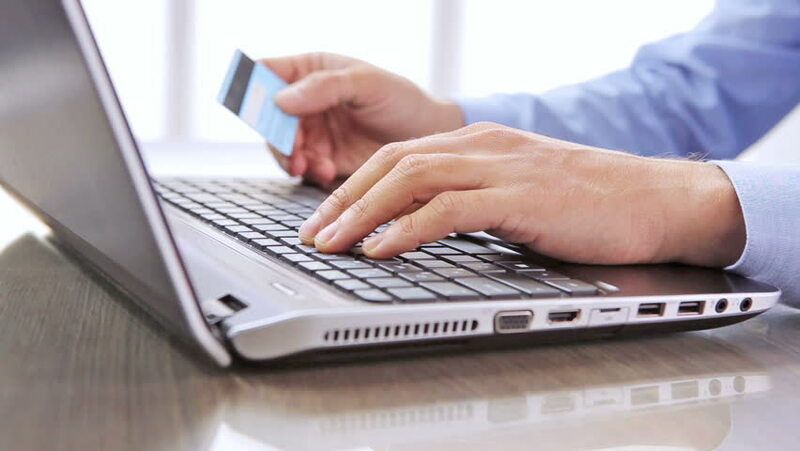 Banking online also offers status updates that may disrupt the bank’s services. The First National Bank posted a warning recently about Hurricane Florence. The First National Bank has two applications, which provide services for personal and business banking needs. There is a simple mobile log in process, which allows you to access your accounts through fingerprint as well as password. 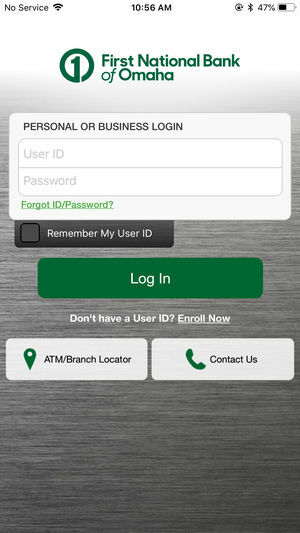 The mobile banking experience offers a fingerprint ID option to log in to your accounts and access other bank services. This service is available on select mobile devices, including iPhone and Android systems. There are a number of transfer features, but one popular listing by the bank is the service that allows you to transfer funds on the go to your friends. This mobile service is available to iPhone and Android users. Helps protect against unauthorized FNB Debit Card usage by turning off your card if it gets misplaced. It also allows you to micromanage your card usage through limiting spending based on geographic region and merchant categories. The First National Bank does have a notable public image as a publically traded bank on the New York Stock Exchange. The digital focused bank is headquartered in Pennsylvania and operates in six other states. This bank does not have the national reach of many of its competitors, but it does offer a variety of services that are well recognized in the states it does operate in. The bank operates in these areas: Pittsburgh, Pennsylvania; Baltimore, Maryland; Cleveland, Ohio; and Charlotte, Raleigh, Durham and the Piedmont Triad (Winston-Salem, Greensboro and High Point) in North Carolina. The bank’s reputation is quite old, it started its services in 1864. The First National Bank’s online operations seem to be popular, but the FNB Direct mobile app has been poorly received as seen through a limited number of customer ratings. There were only 47 ratings available on Apple’s App Store, and the average was 2.1 starts out of 5 stars. Google Play recorded that the app received 1,371 reviews on its platform with an average of 2.75 stars out of 5 stars. The bank has many accounts specific to the needs on the personal and commercial banking levels. Its operations are diverse, but specifically tailored to the regions where it operates in the U.S. such as Pennsylvania and Ohio. There are a number of financial products that are provided through banks, but the First National Bank has a few offers through its webpage that are not usually seen on other bank sites. These range from investment options for individuals to specific account offerings like health saving accounts. Some of the most popular financial products the first national bank online offers are Card Guard, insurance packages, investment strategies, and borrowing opportunities. The First National Bank offers a variety of ways to engage with your accounts whether through online banking or banking over your mobile device. And some of the features across both mediums are niche and unique. The Card Guard feature is especially helpful in the card protections it provides. Many banks do not specify the protections they provide online or over the mobile app. When it comes to keeping your debit or credit card transactions safe, Card Guard seems to be a particularly valuable feature of this bank. Another digitally focused feature provided by the First National Bank is the ability to log in through a fingerprint ID. While this log in feature is gaining popularity among banking apps, it is still not a universal option. This is a potentially standout feature among the locations where the bank has a physical presence in the U.S. The Business section of the site provides a number of services, including many accounts dedicated to specific business-related endeavors. There are accounts for small businesses engaging in everyday transactions to accounts for small business to earn on interest in the long-run. ​Additionally, there are more than a few advising services offered on the First National Bank’s Business section. There are also internationally focused business operations, such as the operation of a foreign exchange. On top of the foreign exchange, the bank offers trade solutions like export, import and standby letters of credit. There are promotional offers available through the First National Bank’s online site. The latest offer includes the newest edition of Business Strategies Today, it discusses ways to make the most of the current economic environment as you pursue your plans for growth. Promotional offers usually aim to have experts discuss the topics and trends that could potentially impact your business endeavors. 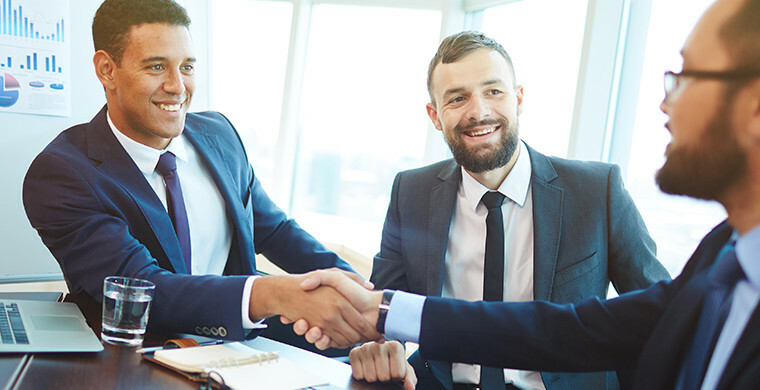 The bank is a smaller name within the U.S. financial world, but it has valuable offerings broken down across various categories from banking to insurance. For a small market entity, the First National Bank has a lot going for it. The First National Bank offers a convenient log in process along with range of account functionality. The bank also offers tons of financial products and services. One of the best ones is Card Guard. On top of that, there are also investment and insurance solutions for personal and business use cases. 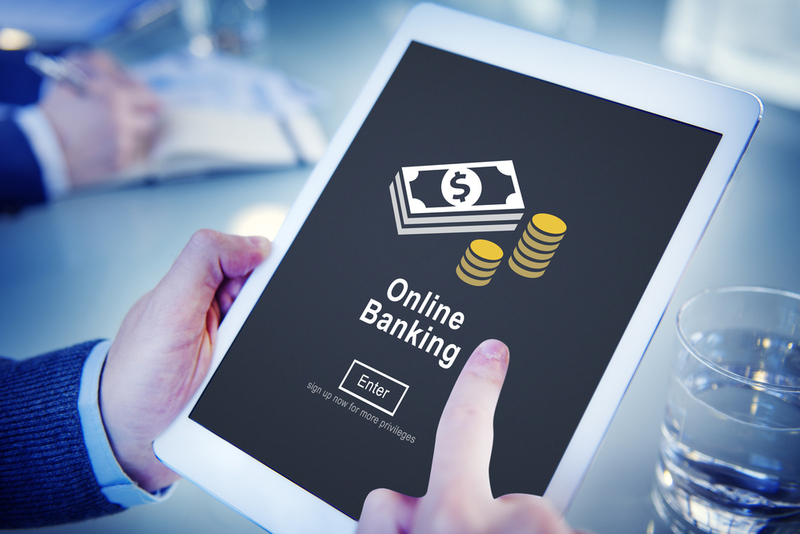 Utilizing the physical and digital banking benefits would be the best-case scenario when deciding to bank with the First National Bank online. Choose to avail this bank’s benefits when in a state that recognizes its services and physical presence.